The Older and Wiser Doctor? Rocking the blue coat with Red Lining.. Tiny Sonic Screwdriver in his hand..
Warmed up to him yet? 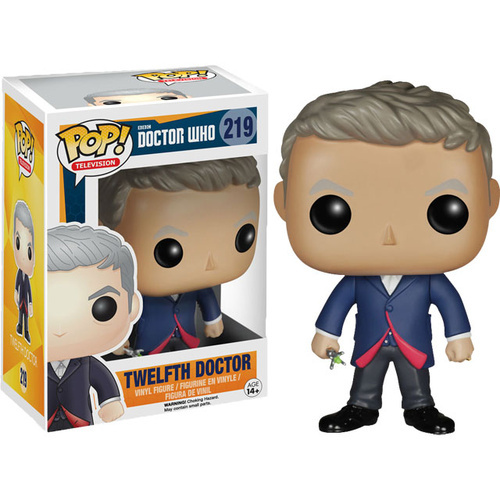 Ok, Ok, as a 9.5cm Pop Vinyl Figure, this version of Peter Capaldi may not have his awesome eyebrows but he's still rocking that blue coat with the red lining, and he even has a tiny sonic screwdriver in his hand. If you're a fan of the latest incarnation of the Doctor then this is the Pop Vinyl for you... Buy this Doctor Who 12th Doctor Pop Vinyl Figure before he disappears into the time vortex forever.